I blanched cauliflower florets in salted boiling water. I also turned my oven up to 450 degrees. Meanwhile I built the base of the dish in my cast iron pan. I started with equal parts olive oil and flour, cooking them like a roux, until it started to turn brown. Then I seasoned with salt and pepper, then added a few cups of milk. When this started to simmer I added handfuls of grated parmesan cheese. 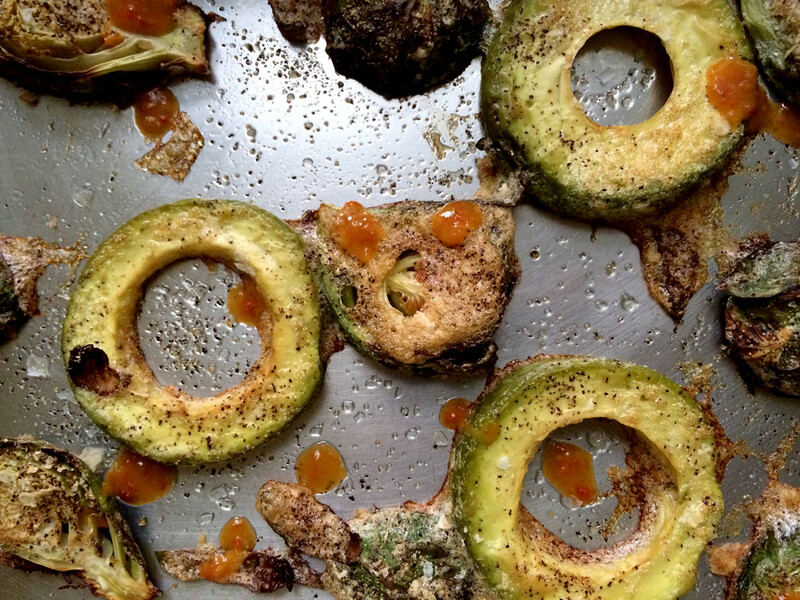 While this was cooking, I peeled and chopped an apple into pieces about a half-inch around. I also cut my day-old bread into large chunks. When the cheese sauce started to simmer I dumped in the cauliflower and the apple, and stirred them around. 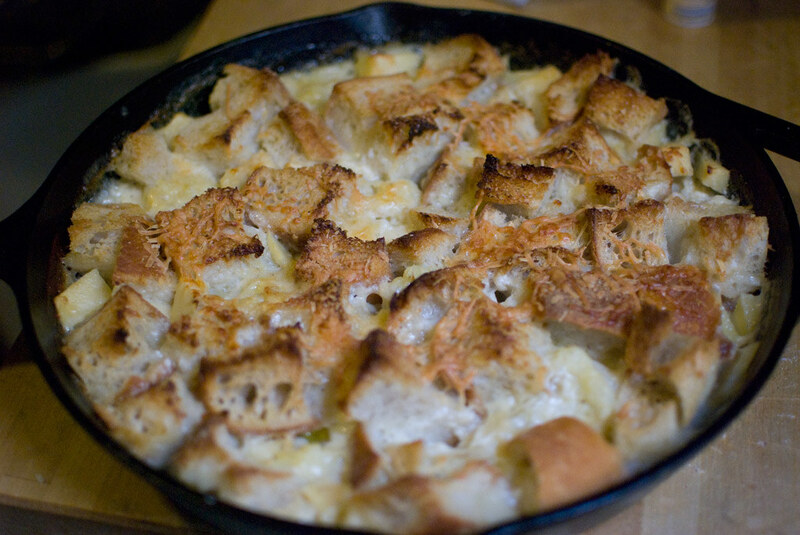 Then I added the bread chunks, sprinkled with more grated cheese, and popped the whole thing into the oven. 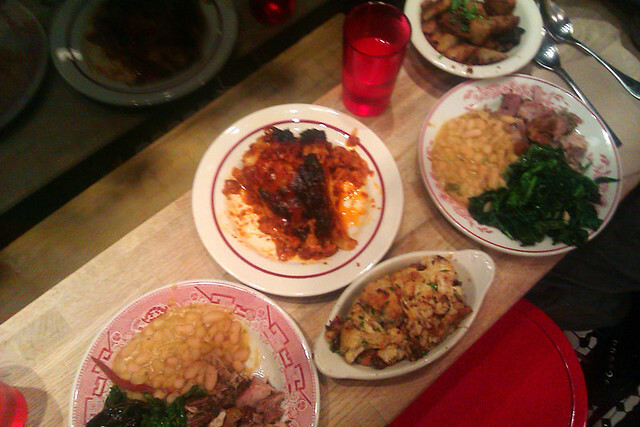 About 40 minutes later it was done. The result was wonderful; salty but slightly sweet, cheesy, crusty on top, creamy and rich underneath. The apples cook through but don’t fall apart, and lend their sweetness to the whole dish. I’ve been seeing yellow cauliflower at the farmer’s market for years now, but I hadn’t used it so much. I started reading about it recently, and apparently the different colors of cauliflower have different nutrient levels. 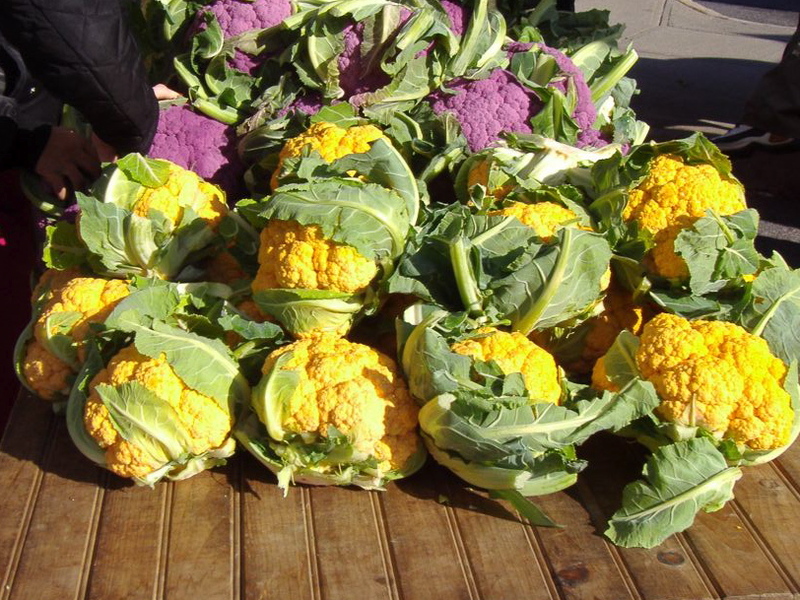 Yellow cauliflower, for example, is way higher in Vitamin A than normal cauliflower (cauliflower is already naturally high in Vitamin C). I also read that it had a slightly sweeter flavor. I bought a couple of heads of the yellow cauliflower and proceeded to cook with them, with varying results. I don’t know if it really has a sweeter flavor, but yellow cauliflower is certainly delicious. Just about everything at the market looked amazing today, which is funny considering it’s now November. 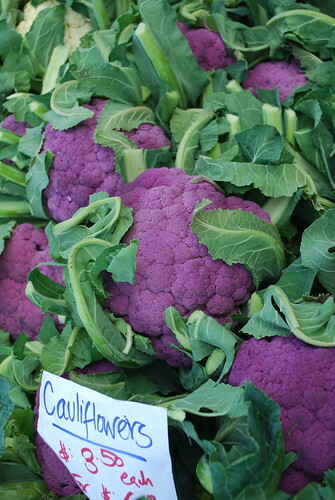 Even cauliflower can be beautiful, especially when it’s purple. Cauliflower gets a bad rap, though it’s growing in popularity now. I like it just barely cooked through — if it is overcooked it gets mushy and unpleasant. Still, it’s not just for raw vegetable platters anymore.